There’s been no doubt over the years you’ve heard and read all the compliments we give to MuffinMan when he releases or blesses you all with his latest works. Over the weekend, our jaws dropped once again when Malte Fulda aka MuffinMan showed the world his custom Kid Katana. 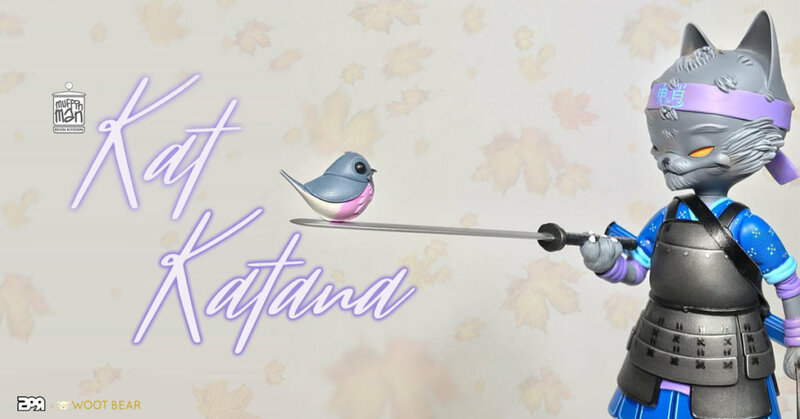 Using 2PetalRose “Kid Katana” the transformation has finished and MuffinMan brings you all a different look whilst including his signature style and including his lovable “Young Robin” into the mix. All this and you can still tell its 2PetalRose’s Kid Katana underneath the extra sculpt. January 12th 2019 2PetalRose solo show at Woot Bear. WHEN: Saturday, January 12th 2019, Artist Reception: 6-9pm. Check out Muffinman on Instagram for more WIP shots, and other such shots that will leave you feeling all beautiful inside. Need some Muffinman goodness? http://www.muffinman.bigcartel.com/. Hahaha, the kanji on the bandana look like bad handwriting because they ARE! I just couldn’t resist.